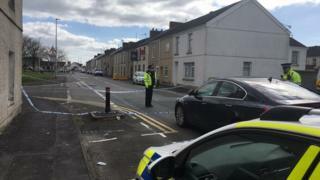 A man has been charged following an incident involving a firearm in Llanelli. Police officers were called to Burry Street at about 02:00 GMT on Tuesday. The 27-year-old is due to appear before magistrates in the town accused of threatening a person with an offensive weapon, affray, threats to kill and possession of a class B drug. Dyfed-Powys Police referred itself to the police watchdog after officers shot a man with a plastic bullet.